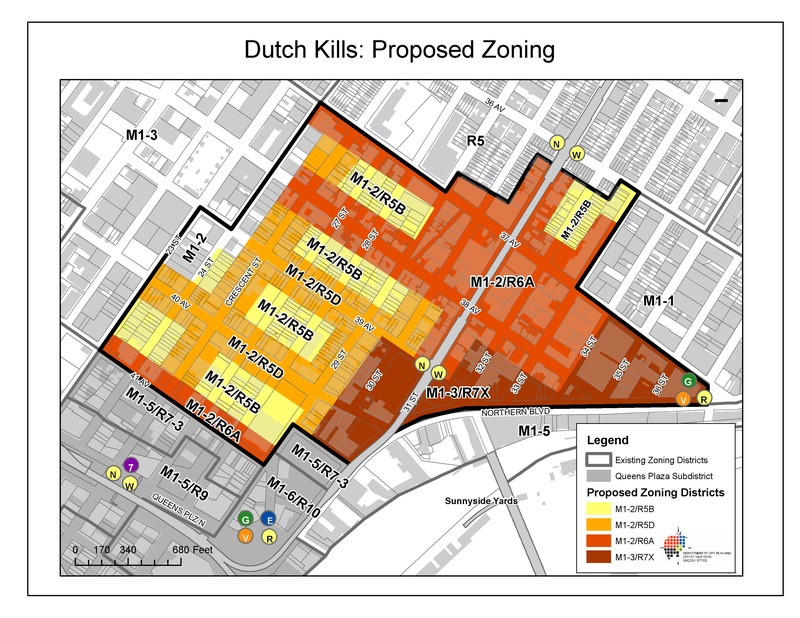 Dutch Kills proposed zoning. image: Courtesy NYC Department of City Planning. Responding to business community concerns, the Council increased FAR in portions of Dutch Kills Subdistrict. On October 7, 2008, the City Council modified the Department of City Planning’s proposed rezoning for the Dutch Kills area of Long Island City, Queens. The plan impacts 40 blocks near the Queensboro Bridge, and establishes the 36-block Dutch Kills Subdistrict. To encourage new residential development and promote the current range of light industrial and commercial uses, City Planning created four contextual mixed-use zoning districts (R5B, R5D, R6A, R7X), each coupled with an M1 district. The City Planning Commission, during its review of the proposal, had modified the plan by increasing the maximum FAR from 2.0 to 3.0 for certain light industrial and commercial uses in areas zoned M1-2. 5 CityLand 139 (Oct. 15, 2008). At the public hearing before the Council’s Subcommittee on Zoning & Franchises, business owners in Dutch Kills called for a further increase in FAR in areas zoned M1-2, arguing that an FAR of 3.0 would hinder their ability to expand their operations. Residents also expressed concern over the recent increase in hotel development, and asked that the plan be modified to prohibit hotel development within the Subdistrict. When members of the Subcommittee questioned John Young of City Planning about the possibility of future hotel development in the Subdistrict, Young stated that by removing residential restrictions and limiting the scale and density of commercial development, City Planning believed that hotel development would be less likely than under current zoning. The vote was laid over, and when the Subcommittee reconvened, it announced a modification to the plan, increasing the maximum FAR from 3.0 to 4.0 only in the M1- 2/R6A district, while retaining a maximum FAR of 3.0 in the M1- 2/R5B and M1-2/R5D districts. The FAR increase will be limited to the same light industrial and commercial uses identified in the Planning Commission’s earlier modification to the plan. After Council’s modification, the plan was referred back to the Planning Commission for review. Council: Dutch Kills Rezoning (Oct. 7, 2008).